Originally four years ago but very irregularly. I would stop back maybe a few times a year and update and tell myself I would keep it up but never did. This most recent foray happened about six months ago and it seems to be sticking. I think the best part so far has just been learning about amazing new books and being able to join in on the conversation with like-minded people about books that I enjoyed. I have found some new favorites through recommendations from fellow bloggers. I have pretty eclectic taste in books. I try to mix in Classics with recent fiction and YA. In terms of genre mostly fantasy, historical fiction, and paranormal. There are so many to list. My current five favorite standalone books are The Historian, The Alchemist, Wuthering Heights, The Heart is A Lonely Hunter, and new fave Attachments. My five favorite series are Harry Potter, A Song of Ice and Fire, The Wicked Years, The Luxe Series, and The Hitchhiker's Guide to the Galaxy. The best and most tangible thing that has happened to me since blogging is probably that my reading has become much more critical, and it has has become much more frequent. I feel like I'm reading a lot more and I'm pushing myself to read a lot more. Maybe it's just my competitive nature and the need to keep up with everyone else in the community. Reaching back to the classics for this answer. I studied abroad one summer in the UK. We spent two weeks in Edinburgh, Scotland (a delightful city, by the way). One of the books we read for our class was Waverly by Sir Walter Scott. This book was universally hated by everyone in our class - myself included. Not only was the writing overwrought and wordy, but we all hated the main character who was supposed to be the "hero" but was more of a pansy. When we finished the course, we took our copies of Waverly to the Sir Walter Scott monument in Edinburgh, left them at the foot of the big statue, and said "Take it back, Walter, take it back!" That's a rad story! Enjoy your weekend, Alison! Interesting to me that your whole class didn't like the book! Wow! A lot of people are picking classics for this one, I've noticed. But that book sounds like a big of a drag. LOL, do you think he did take it back? It sure made for a fun memory for you, though, and probably for other people in your class, too. I've only a couple of Scott's books but not the one you've mentioned.... does sound sucky though if the hero is a pansy! That's a rather amusing story. I've never read that book, but if your entire class universally hated it, I can't say I'm tempted to give it a chance. Especially with a pansy hero - no thanks! What a cute story. I've never heard of that book but I don't read many classics. Have a great weekend. I'm not really a fan of the classic's so I've never read it. Hey Alison, I'm a bit confused for next week's question. Is it just any destinations we would like to visit during Spring Break? I would feel sorry for the classics, they seem to be getting bashed quite a bit today. However, I don't even bother to read them since I dislike them so much! Another time, another place I guess they were good. Just so many of them have not held up. Old follower. That's funny! Not one person liked it? Wow! Thanks for dropping by my blog earlier. LOL! That's an awesome response! Classics can be very hit or miss for me. 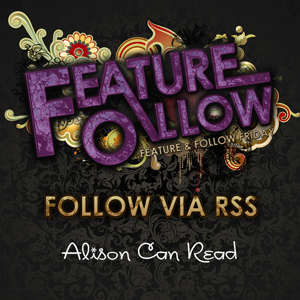 Thanks for stopping by my blog Alison =) Have a great weekend. Well, I could list a WHOLE bunch of classics that fall in this category (IMO.) We had to read The Yellow Wallpaper for a lit class in college. I hated that book. I think its only about 80 pages long, but yuck. Thanks for visiting! Thanks for stopping by earlier..Old follower..
LOL love the response to a book you all hated. Thanks for stopping by my FF, existing follower via Bloglovin'. Hi Allison! Thanks for stopping by my blog. What was your favorite thing about Scotland? I'll be sure to avoid Waverly. I never liked classics. Thanks for stopping by! lol, kind of funny how the whole class hated it so much. Awesome that you got to go to Scotland though!